North Carolina is at an important crossroads in how it pays for its K-12 public schools, and dramatic change may be on the horizon. The 2017-19 state budget that was signed into law last month created a special legislative committee, known as the Joint Legislative Task Force on Education Finance Reform, to study the way the state pays for public education. The committee will meet over the next year to review current laws and policies for public school funding, and it will make recommendations that may be introduced as bills designed to change the way North Carolina pays for public education. The study committee is the result of a report by the state Program Evaluation Division (digest, full report, presentation) which revealed that North Carolina’s method of financing public education was out of step with other states in ways that were creating gaps and inequities between and among school systems. Under the current law, the General Assembly develops an education budget that pays for local school operations, district central office administration, and the Department of Public Instruction staff, all of which is largely based on student enrollment. Adjustments are built in for special circumstances such as low-wealth counties, underperforming schools, and small school districts, among others. Many counties, like Wake, supplement state funds with money from local property taxes. It should be noted that, except in special circumstances, the state does not pay for school construction, renovation, and maintenance. That is mostly funded by local property owners. This practice of supplementing state funding with local tax dollars has been in place for a long time, but it has recently become a major issue as the state public education spending has become more austere. Reduced, stagnated, or low-growth state funding has pushed more of the financing responsibility onto the Wake County of Board of Commissioners and the property and sales taxes. That is not a sustainable model. Local taxpayers have shown consistent support for a top-tier public schools system, but there will come a point when local taxpayers will decide they cannot afford and will not support annual tax increases to pay for costs which should be paid by state government through its revenue streams. The way North Carolina finances public education can be traced back to the Great Depression when, in 1933, the General Assembly passed the School Machinery Act, which created a sales tax to pay for school operations. This made the state the primary source for education spending, but it kept the county or municipality in control of local education decisions, a practice which continues today. State funding was updated and modified significantly throughout the second half of the 20th century to accommodate desegration efforts in the 1970s and 80s and to usher in the age of student accountability in the 1990s. Part of this period included the landmark federal lawsuit known as Leandro v. North Carolina which was decided in 1997. The ruling ordered that all students in the state have a constitutional right to a “sound basic education”. In the past decade, major changes in public funding have included an increase in the number of charter schools and public financing of private school tuition known as “opportunity scholarships,” but often called vouchers. Changes in federal regulations for public education over the past 50 years have also contributed to what is now a complicated system of financing public education. As mentioned, North Carolina decides how much to spend on education based on how many students there are enrolled in traditional public schools and charter schools. This headcount is called the average daily membership (ADM), and that number is used to decide how many teaching positions are needed in a school. Each teaching position is called an allotment, and these can be distributed according to certain guidelines within a school building or school system as the leaders deem necessary. ADM doesn’t take into account the actual cost to educate a student. ADM is also used to calculate spending in other areas such as textbooks, supplies, and school buses, however, textbooks and supplies have largely gone unfunded in the past decade. In addition to ADM, there’s a patchwork of other funding formulas used to pay for routine, but unique, costs as well. In short, as new spending priorities occurred over the 80 years since the School Machinery Act, new legislation was passed to accommodate those priorities. This has created a complicated system of accounting that requires special training to understand, and the school systems with the right knowledge of how these various rules and regulations work can reap the reward while others leave money on the table. 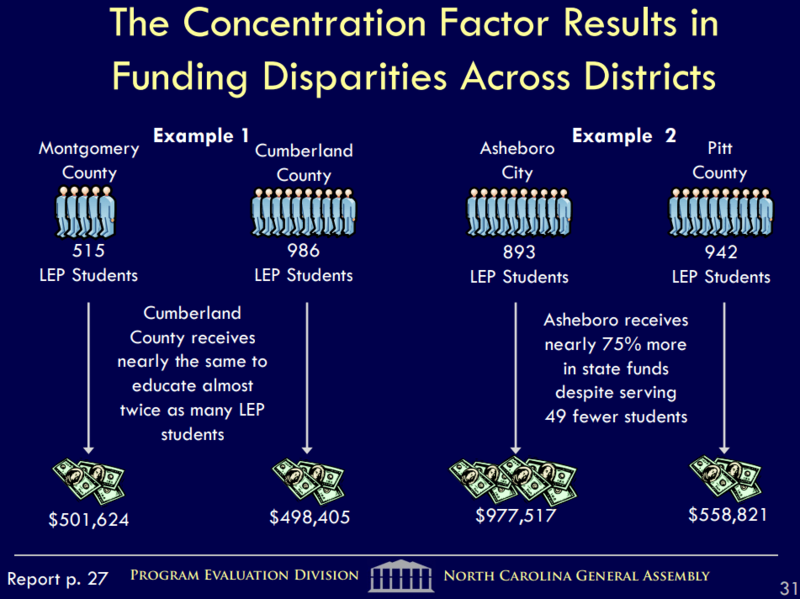 The current funding method also creates special circumstances for low-wealth counties and small districts, but not for high-growth areas like Wake and Mecklenberg counties. With 67 people moving to Wake County per day on average, local officials estimate about 18 of those people are school-age children. That is the equivalent of kindergarten class moving to Wake per day. There’s no funding adjustment for rapid growth, and therefore the local taxpayer picks up more of the cost than in other school districts. All of this, with specific examples, was covered in the Program Evaluation Division Report, which highlighted inequities created by ADM-based allotment funding. There’s actually two major categories of allotments in North Carolina: position allotments and dollar allotments. 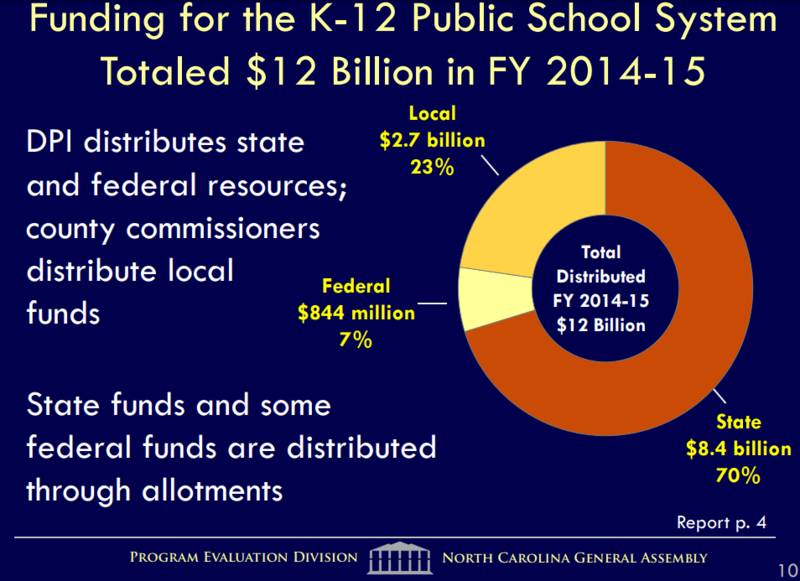 Position allotments made up about 60% of state funding in the 2014-15 school year, or $4.9 billion. Dollar allotments accounted for the rest, or about $3.5 billion. Among the two categories, there were 37 different types of allotments. A position allotment pays for a teacher, but it doesn’t consider the cost of the teacher. For example an allotment might pay for a 25-year teacher with a Master’s degree and National Board Certification as easily as it might pay for a third-year teacher paid on the base pay schedule. Clearly there’s a big discrepancy in the cost to fund that position. One teacher could cost the state close to $60,000 per year while another might cost the state a little more than $36,000 per year, not including the local pay supplement. Dollar allotments present different problems. Based on ADM, dollar allotments may have a negative effect on districts with high concentrations of students with disabilities or with limited English proficiency, among others. Once all the allotment scenarios are settled for the school year, the local school systems have had, until recently, the flexibility to transfer allotments to other categories to help cover the gaps in other areas. Until the 2013-14 school year, a common practice to reduce class size was to convert a teaching assistant allotment into a teaching position allotment. The General Assembly eliminated the practice that year. This year the state budget also ended transfers out of special education, limited English proficiency, and others starting with the 2017-18 school year. Now gaps may not be filled. The state did not increase funding in areas where additional teaching positions may be needed, and local tax dollars are not available to make up the difference. These examples are just on the surface. The Program Evaluation Division report estimates it takes about four years to know how to navigate the state’s allotment system. That’s just to have a basic, or working knowledge, level of understanding. Many school districts actually hire outside consultants to help them manage the allotment system. North Carolina is one of about seven states which use a “resource allocation” model. Many states have modernized their public school finance methods, and one that is gaining popularity is called Weighted Student Funding because it is designed to pay for the actual cost of educating a child based on the needs of the child. The study committee created in this year’s budget, which consists of nine senators and nine representatives, may consider any number of possible changes to the way the state pays for public education, but the Program Evaluation Division’s report indicated a preference for the Weighted Student Formula. This method of paying for public education allows the money to follow the student rather than the money following the teacher, as it does in the resource allocation model North Carolina currently uses. 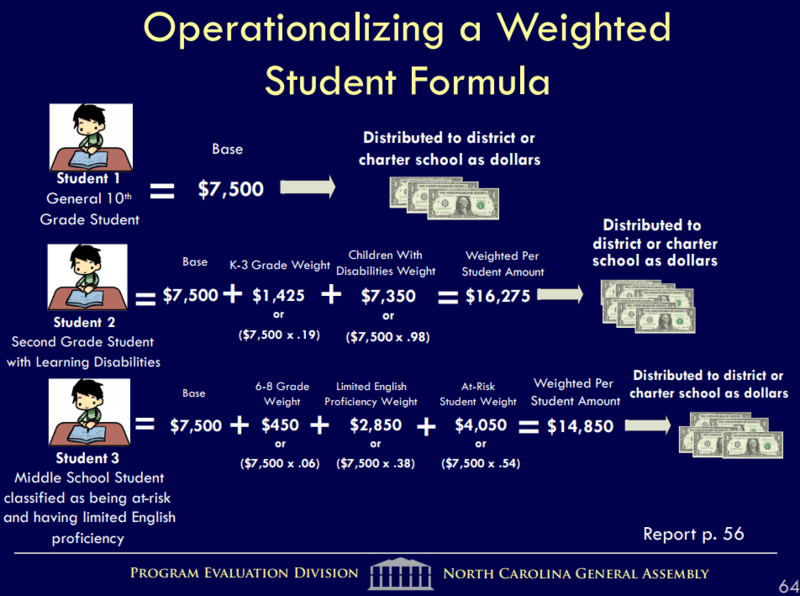 Using the weighted student method, the actual cost to educate a student is the determining factor in how much money a school system may receive. It would still use enrollment as a driver for funding, but it would also consider the different types of educational services that they would receive. For example, if the base cost to educate a student is $7,500 per year, then all school systems would receive this base funding amount. Additional state money would then be added based on the cost to educate students. A student in kindergarten may cost more than a student in 7th grade, and therefore more money would flow toward the kindergarten classroom. A student with a diagnosed disability in the 8th grade may require more services than a fourth grader who is learning English, and therefore more dollars would flow toward the 8th grade. If done right, this could mean that school systems receive adequate funding from the state. It would take the pressure off local taxpayers and county governments to make up the difference between real needs and state support of those needs. It would give school systems a different type of flexibility to staff its school buildings while providing the financial transparency and accountability that many people say are lacking now. Although there are many blueprints in place in large and small school systems around the country, there is no model that could North Carolin could use as a carbon copy. That means the study committee on education finance reform could design a weighted student formula that considers all the intricacies of financing public education in North Carolina. The pitfalls, however, are innumerable. The committee would have to establish a base amount to educate a student in North Carolina. This amount needs to cover the wide disparity between education costs across the 115 school districts and all charter schools in the state. The committee would also need to decide the value of each weighting condition to establish a uniform factor to add on to the base weight. For example, they would have to decide that it costs, say, 19 percent more than the base weight to educate a student in grades K-3. Then, of course, is deciding the process that would take place to update these numbers as needed. Perhaps technology improves service delivery and produces a savings, or the federal government ends a program which sent money to the state for specific groups of students producing a resource gap. If there’s no way to adjust the formulas to accommodate these realistic changes, then North Carolina could quickly find itself back in the complex system it has today. The committee may also decide to develop its own funding formula which has nothing to do with weighted student funding, or they may decide to only make piecemeal changes to the way the state pays for public education. No matter what, there’s near universal agreement at all levels of government in North Carolina that change is necessary. The state has reached an important crossroads, and the path ahead is going to require creative thinking, open minds, and a willingness to put students first. All images courtesy of the Program Evaluation Division Presentation Slide Deck, “K-12 Presentation.pdf” from Nov. 23, 2016.